I am doing a shout out to my former student “Nate”. 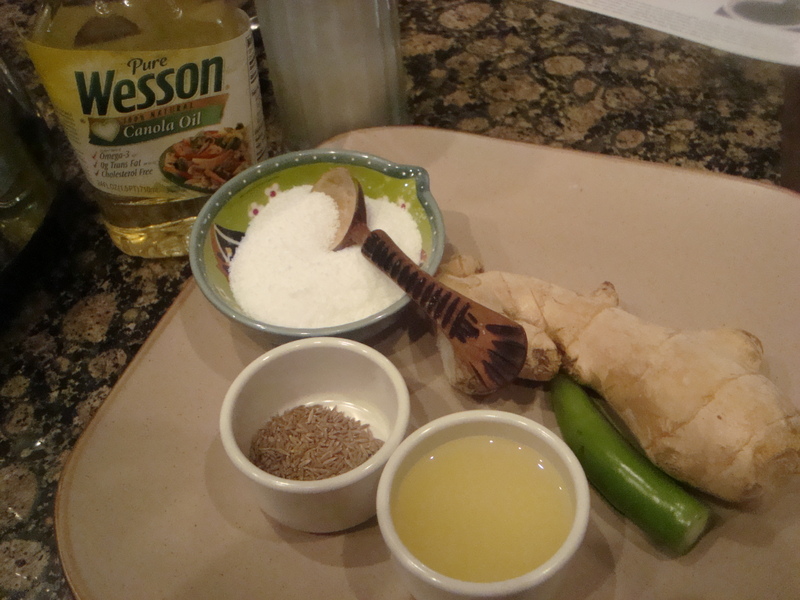 He mentioned several times in class how much he loves to grill and I promised him some Indonesian/Thai inspired food…. so here it is Nate!! 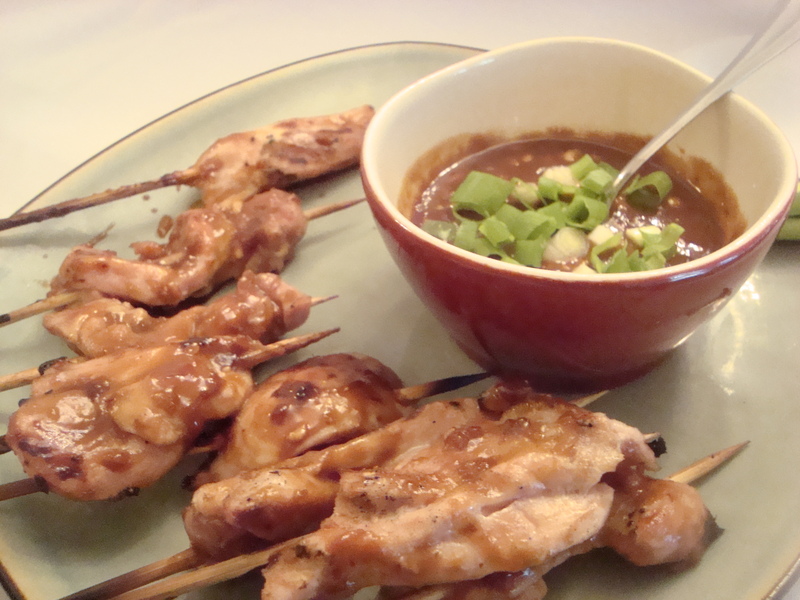 Not only are these Chicken Satays very quick and easy to do, they are high in flavor and low in fat. Perfect accompaniment for our summer workouts. (I should mention that we’re almost done with our first week of P90x and Insanity and I’ve lost 1 1/2 pounds so far….13 1/2 to go!). I should mention that I always prefer to use chicken thighs over chicken breast because they have a lot more flavor and they are a lot cheaper too. You can buy boneless, skinless chicken thighs or you can easily de-bone the chicken thighs at home. 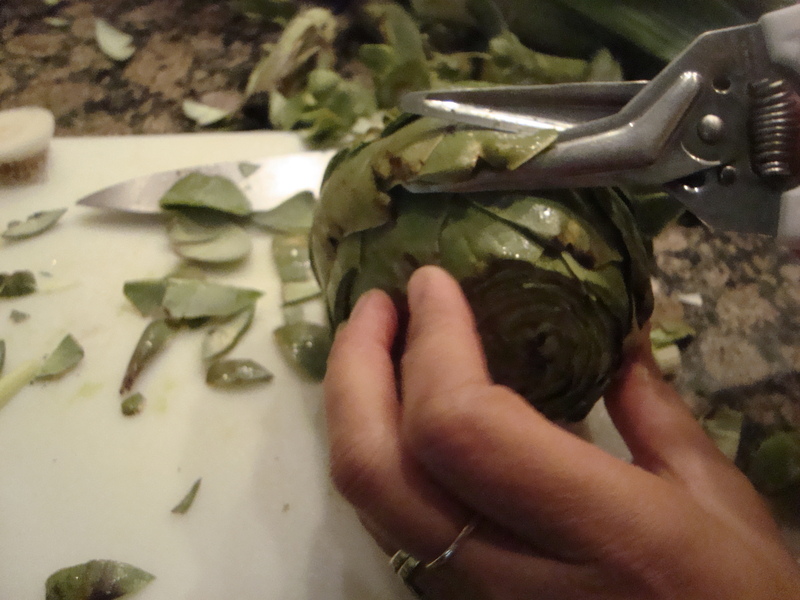 All you need is a sharp knife and the ability to cut along the edges of the bone and you’re done!! 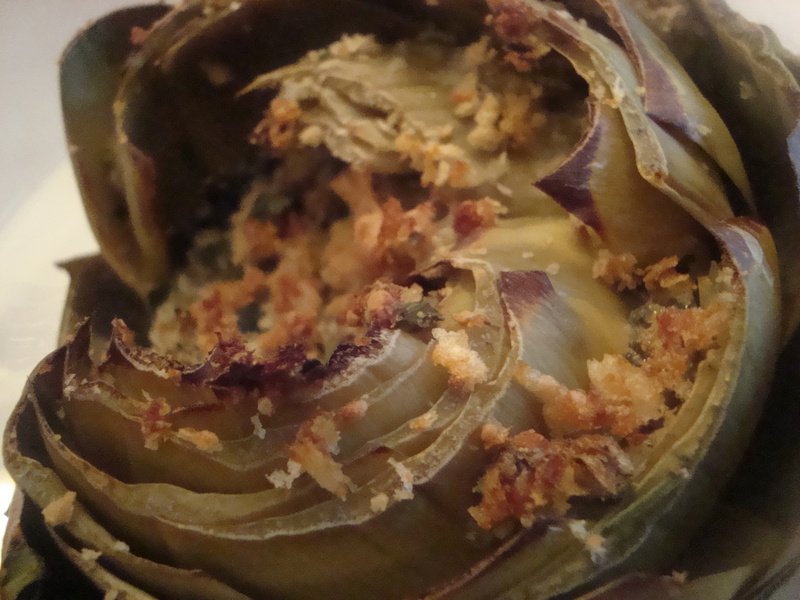 The secret to this dish of course is the sauce. 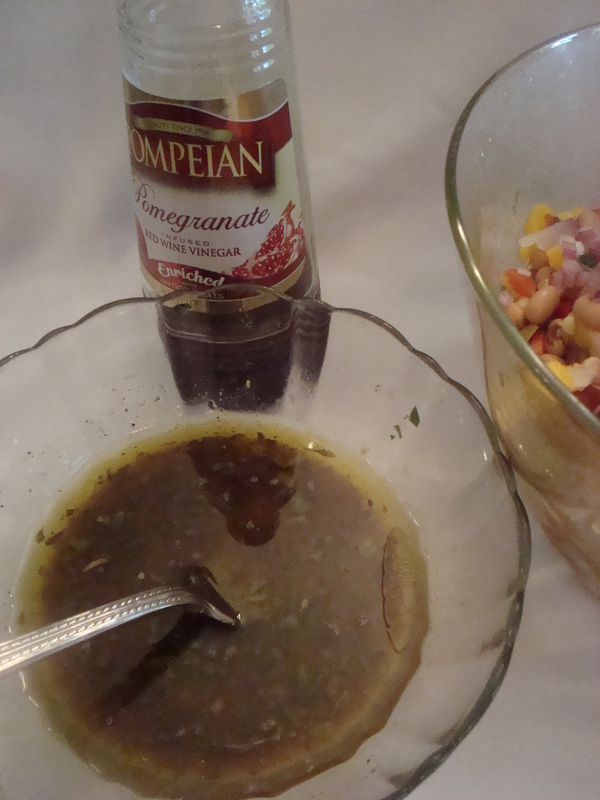 I love how this sauce turns out. 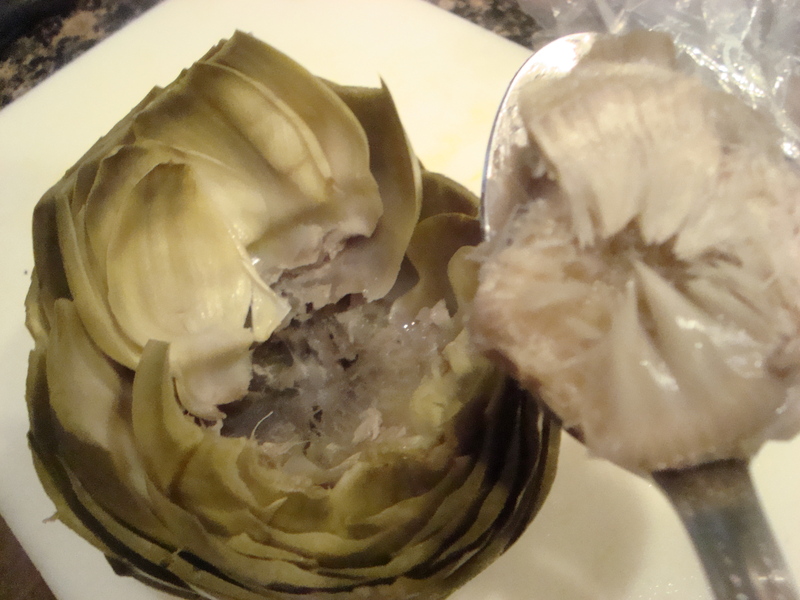 I could eat it by the spoonful but then I’d have to work out some more. Please do use the Sweet Soy Sauce instead of the regular soy sauce. If you must use regular soy sauce then choose the low sodium kind and use only 1/8 cup otherwise your sauce will be very salty. 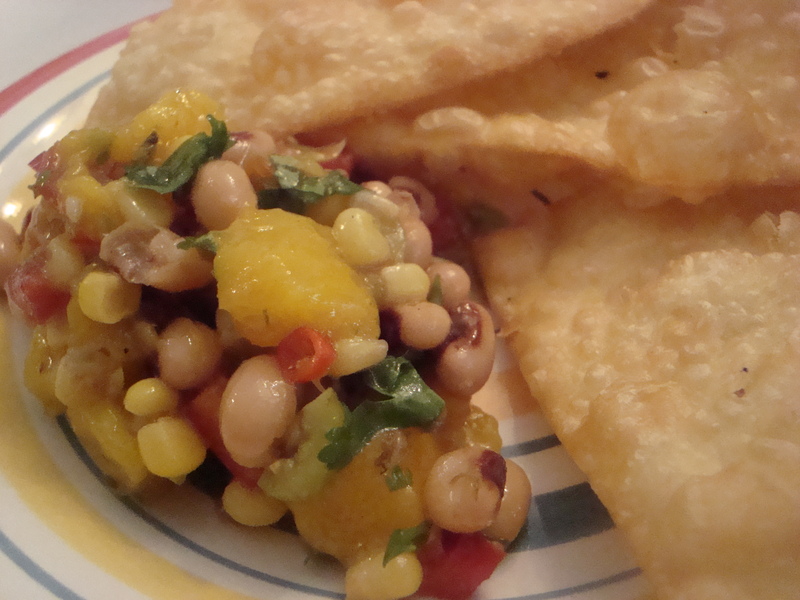 This is great as an appetizer or a main dish served with Coconut Fried Rice and a fresh crunchy salad. We also ate other veggies dipped in the sauce along with our chicken! 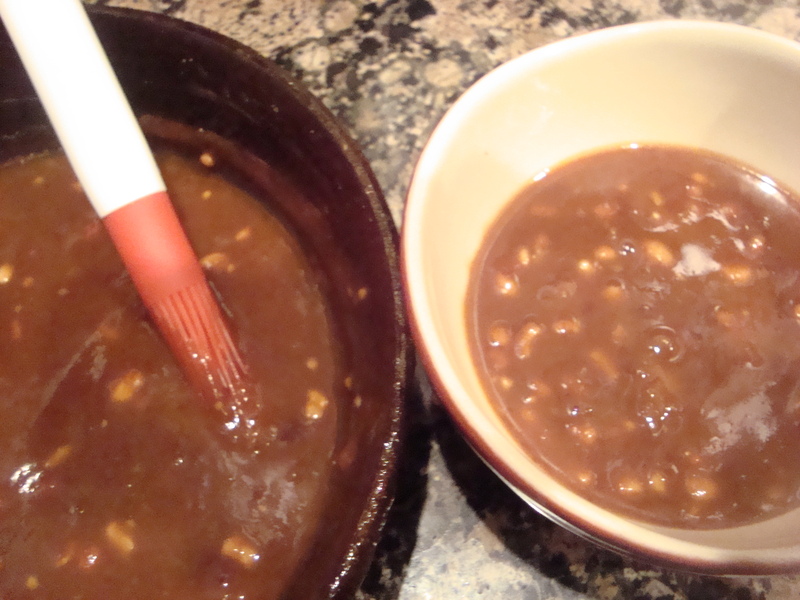 Divide the sauce, one for dipping and the other for basting! 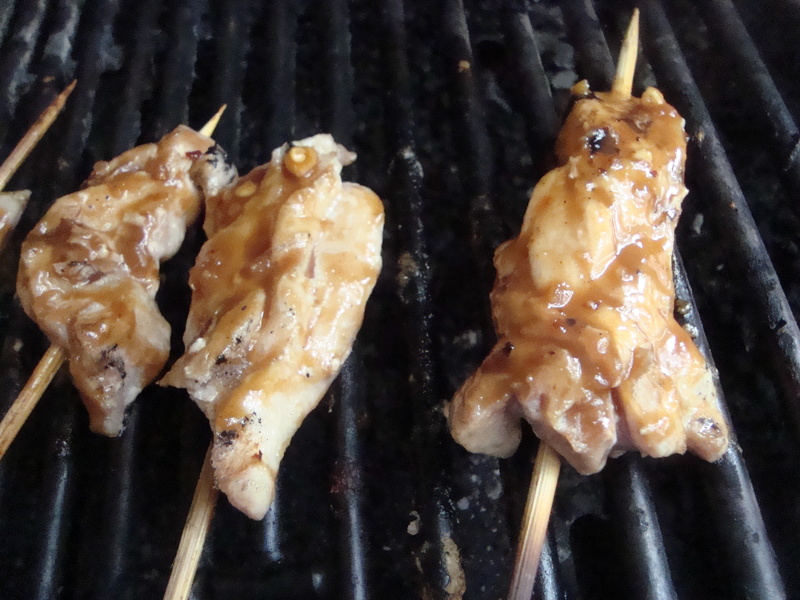 Place chicken skewers on grill and cook for 6-8 minutes turning over once. 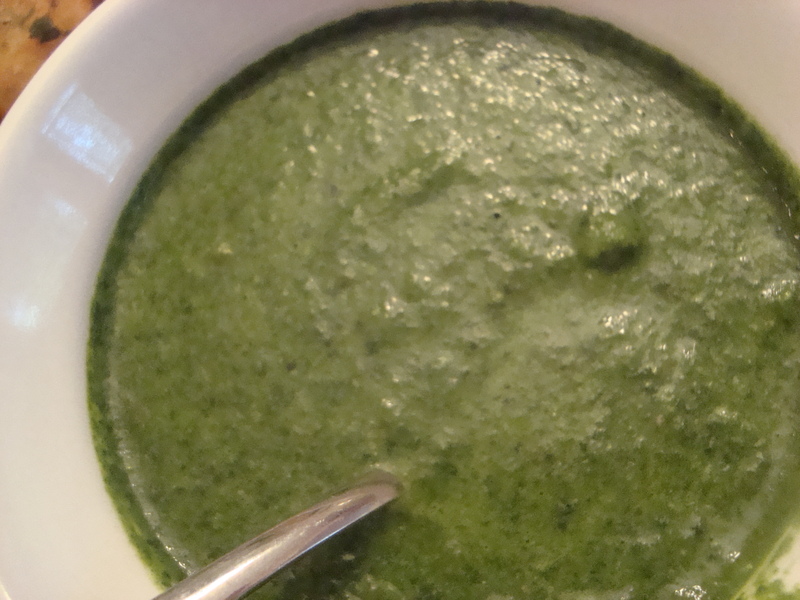 In a saucepan place all ingredients except chicken and scallion. Cook over medium heat until sauce is bubbly. Take off heat and cool sauce. 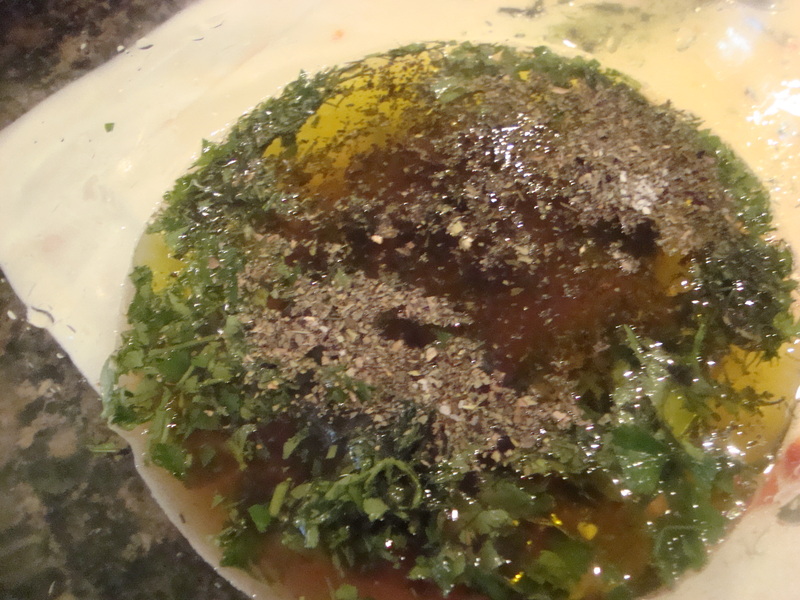 Divide sauce into two parts. 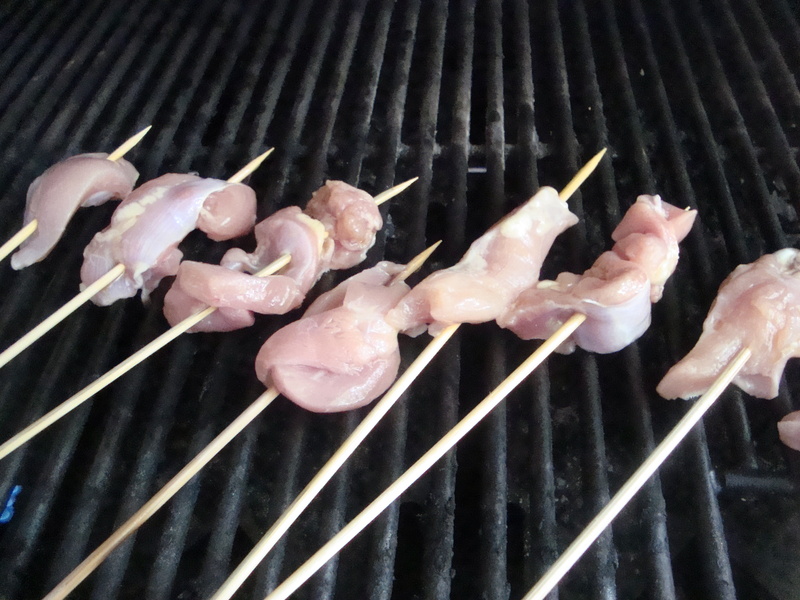 Cut chicken into 1″ inch long strips and thread onto skewers. 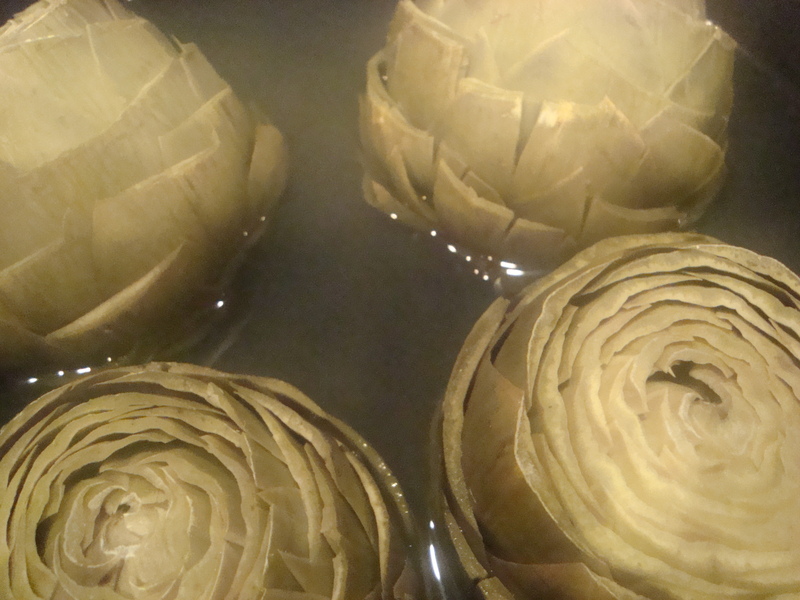 If using bamboo skewers make sure you soak them before hand so they don’t burn and fall off. Spray chicken with non-stick cooking spray and place on hot grill (about 300-350 degrees) cook for 6-10 minutes covered, turning once. 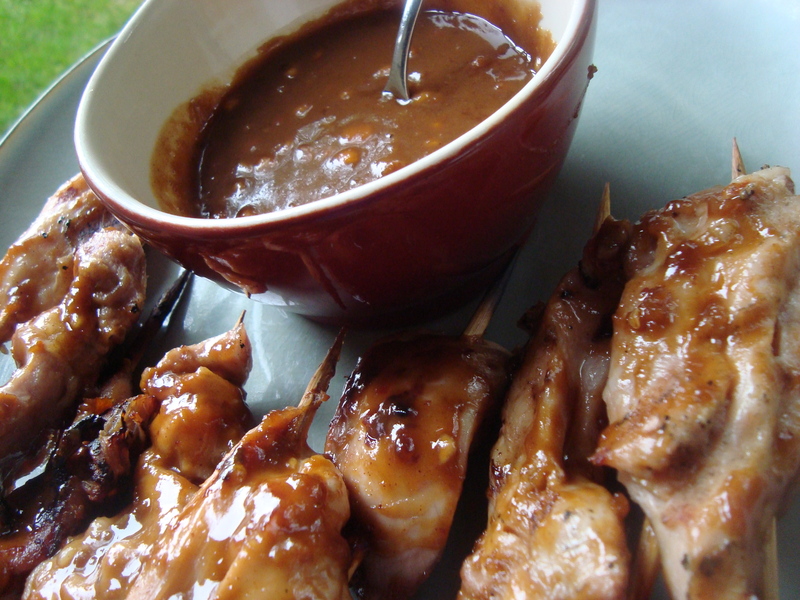 Baste with half of the sauce (make sure the dipping portion is never in contact with the raw chicken) during the grilling process and serve with remaining sauce garnished with sliced scallions. 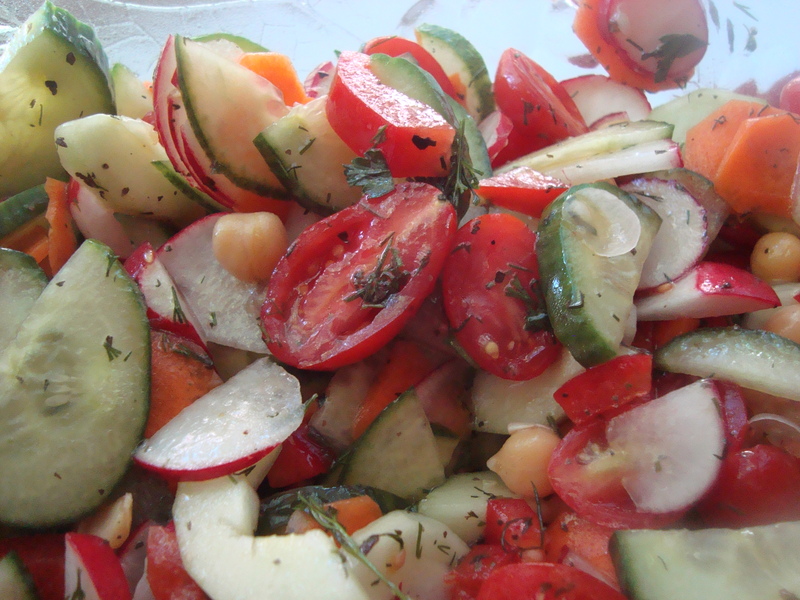 The sauce is also fantastic for dipping carrots, cucumbers and other fresh veggies as well. 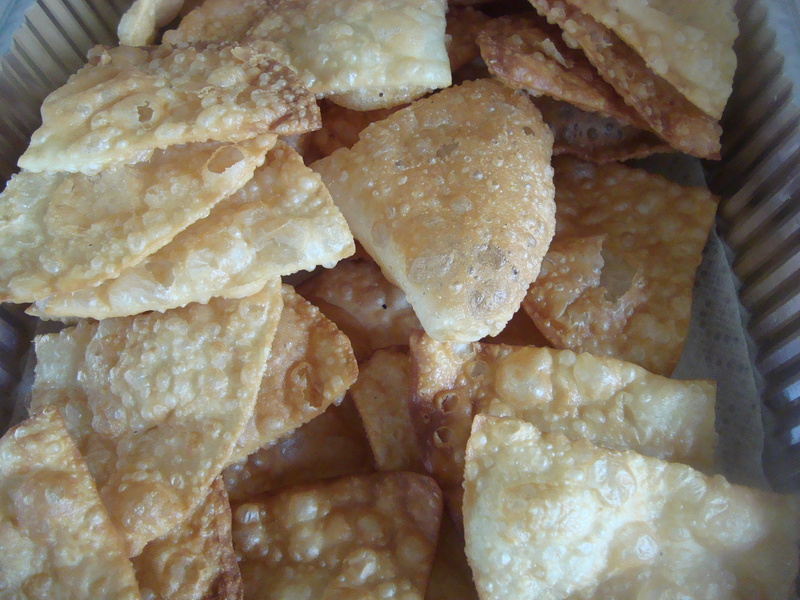 Growing up, having Singharas and Samosas as “tea time” snacks were really common. Because of the British influence, having “tea” at around 6:00 p.m. everyday was the norm and then dinner would follow about 8:30 – 9:00 p.m. Tea time would usually include all manner of foods, including seasonal fruits, home made snacks, biscuits (cookies), Nimkis (savory home made chips), Singharas or Samosas and tea, of course. 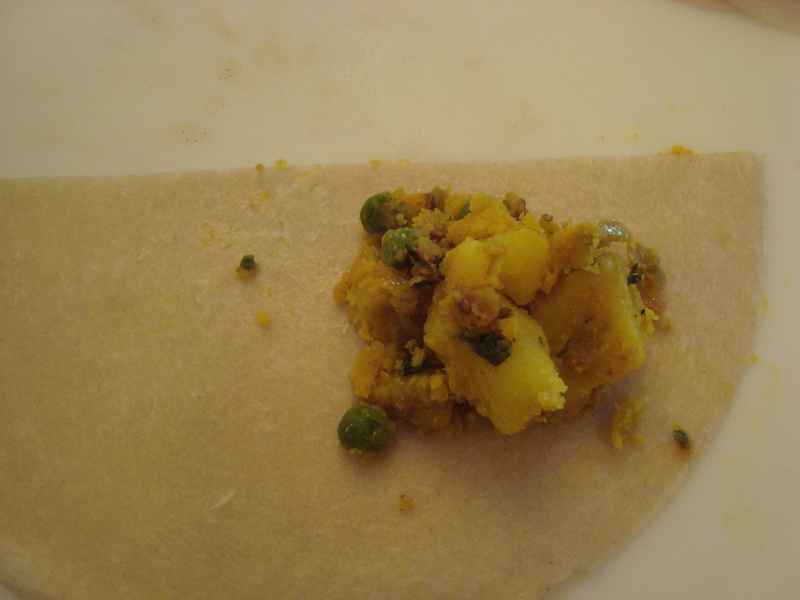 Here’s the main difference between a Singhara and a Samosa. 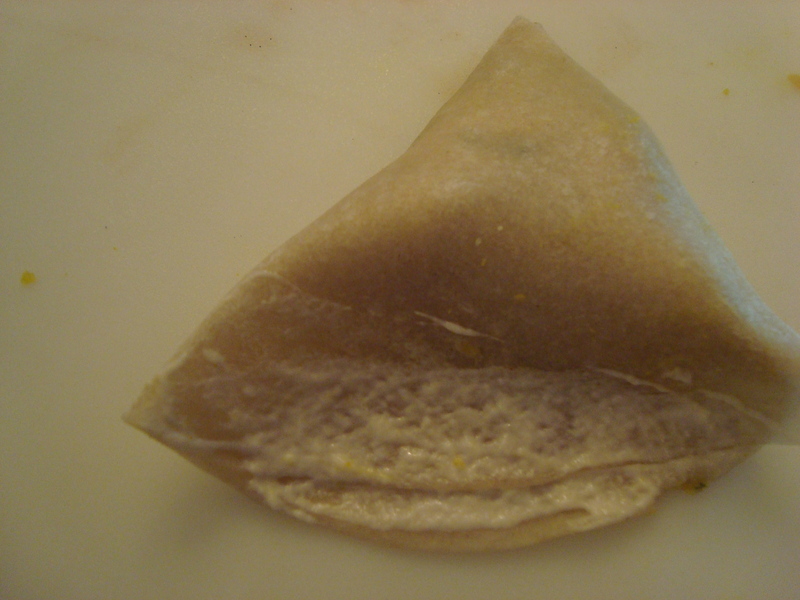 Singharas are usually eaten in Bangladesh and in the West Bengal area of India. 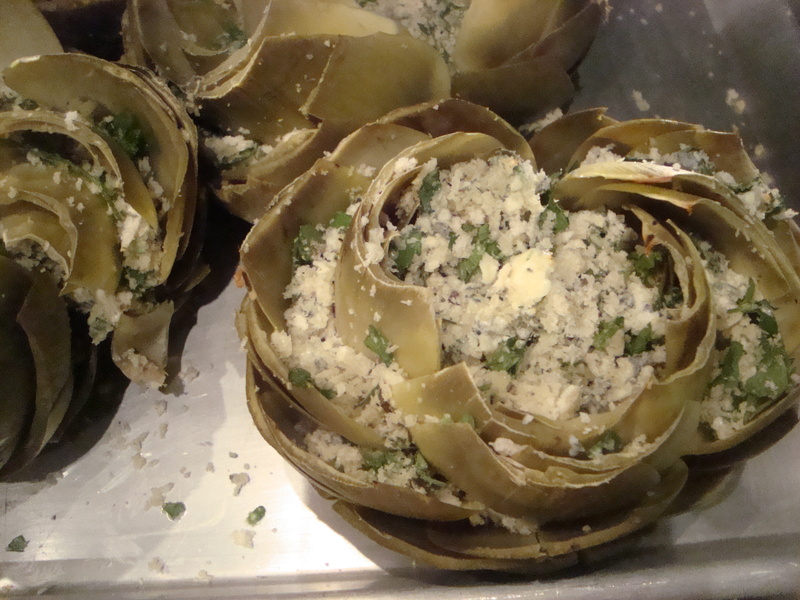 They have a crispy shell and although they are triangular in shape, they can “sit” upright. 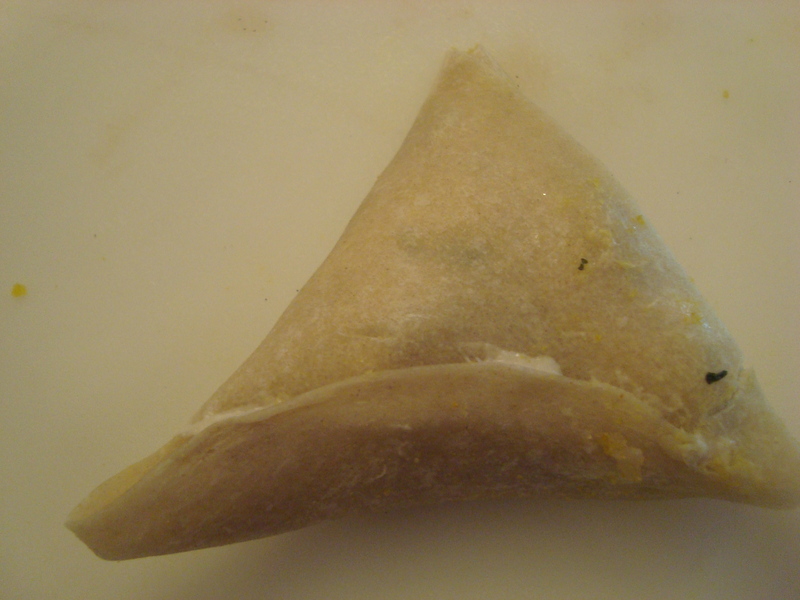 Samosas also have a crispy shell but are flat and triangular. 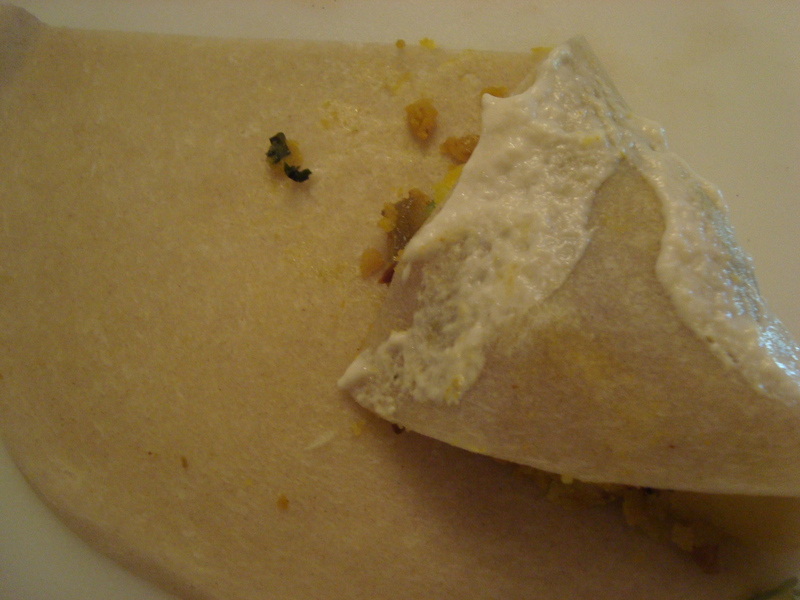 The fillings can be as varied as the region and depends on the cook. 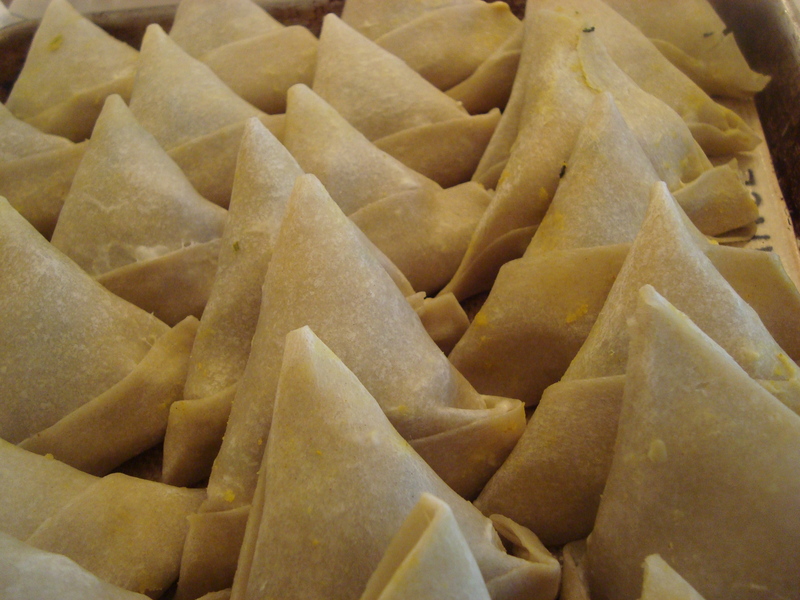 Some samosas sold street side as snacks have vegetarian fillings, some are beef or chicken while others are tiny and filled with caramelized onions. 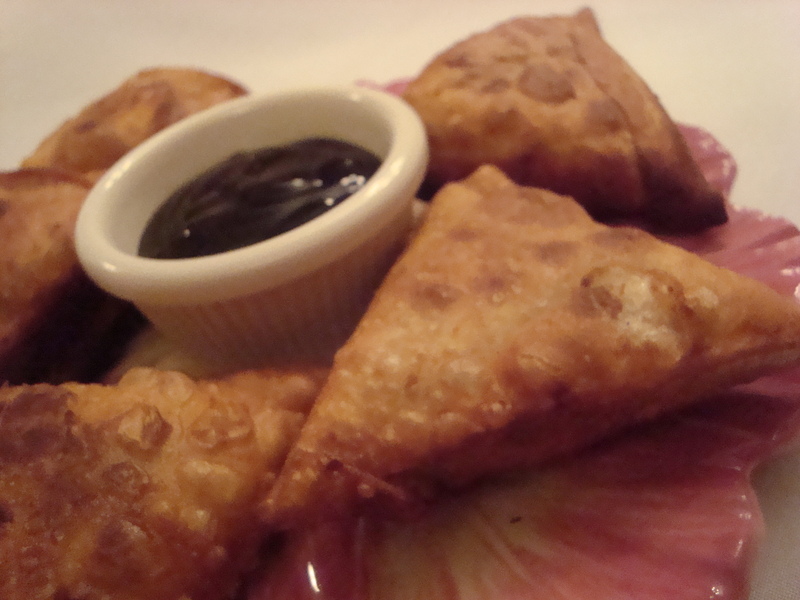 Most samosas and singharas are served with a chutney or dip of some sort. 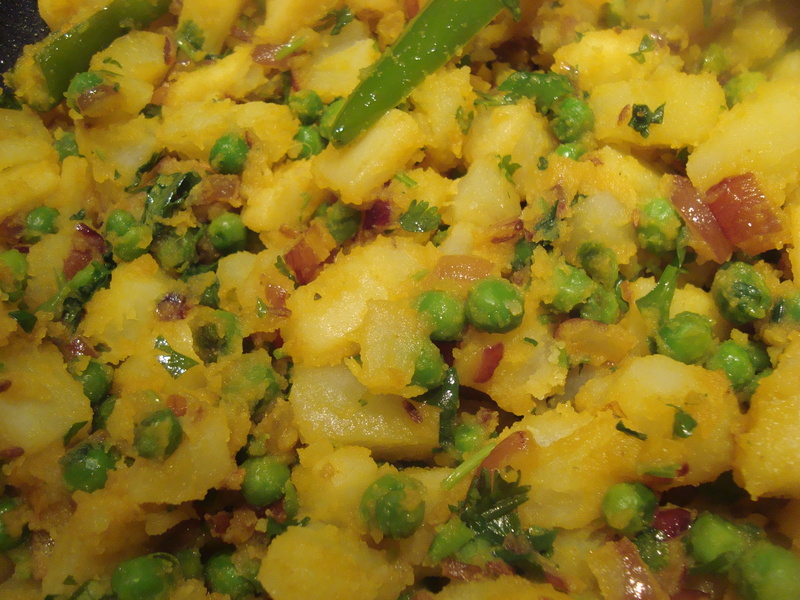 Usually a Cilantro Chutney or a Tamarind Chutney. 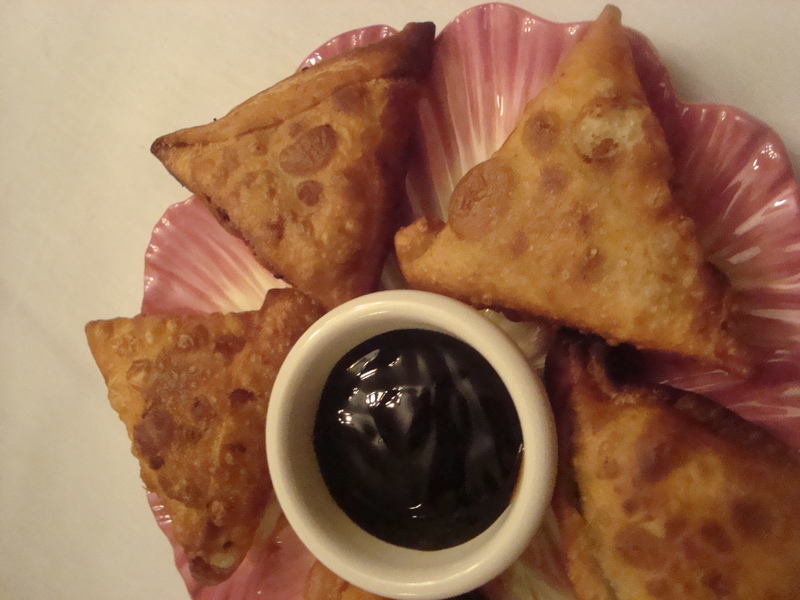 I used to try to avoid making samosas because they are time-consuming. 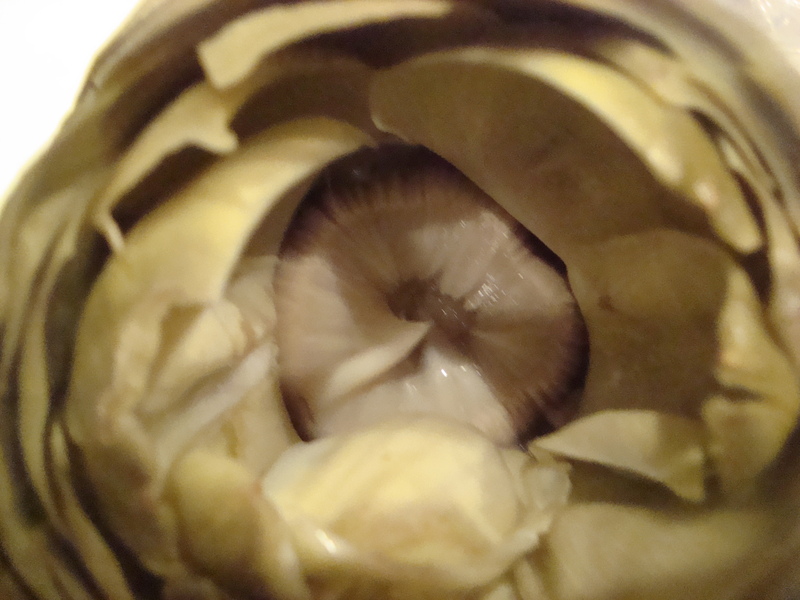 They sure are delicious though and great to have as a treat. 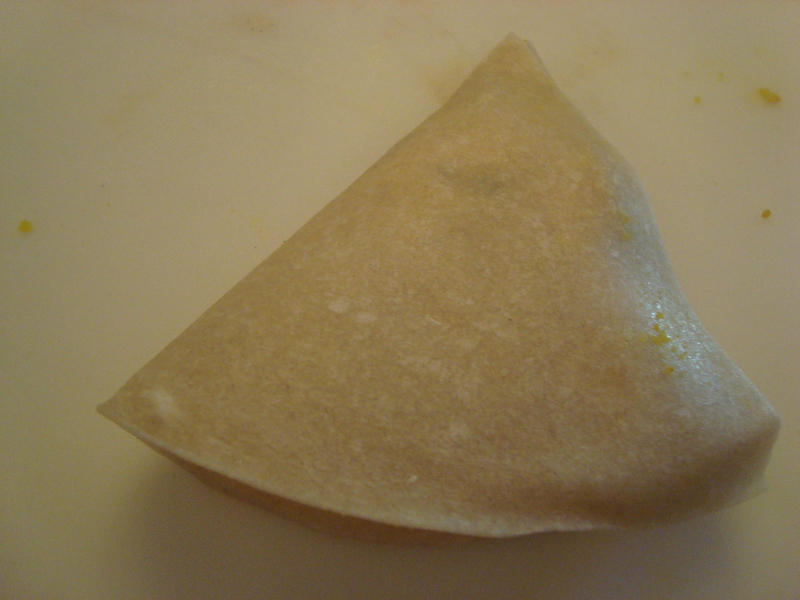 I figured out a quick and dirty version of making samosas. 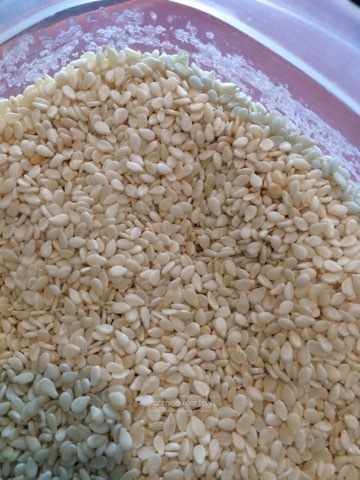 Most of the time is taken up in making the dough, rolling it out and shaping them since the filling is pretty fast to cook. 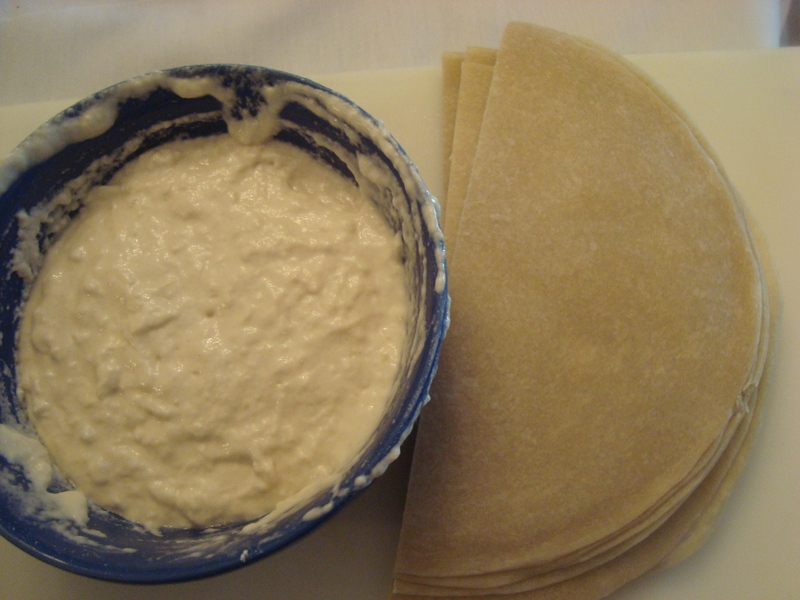 I started using tortillas as the shell and really liked how they turned out but they had a little difficulty staying together. 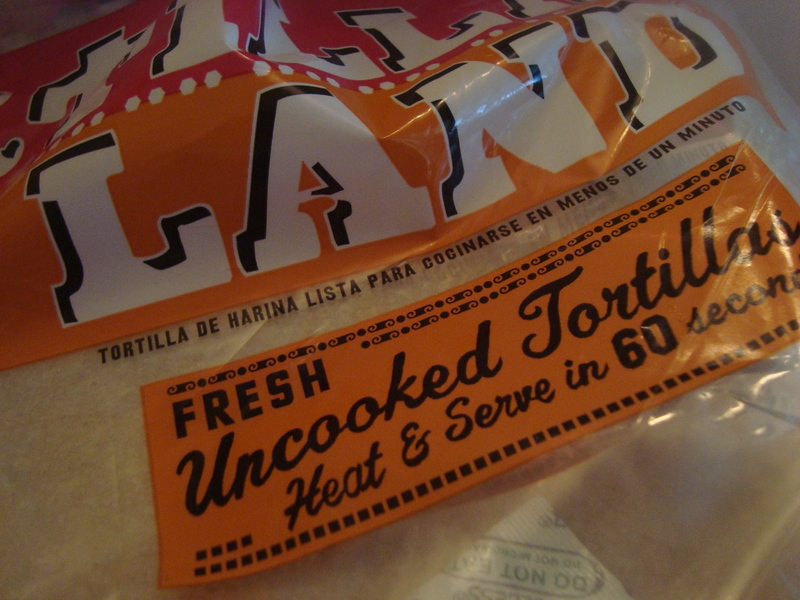 Then I discovered the uncooked tortillas. They are sold at any Costco or even in Walmart (and several other grocery stores). 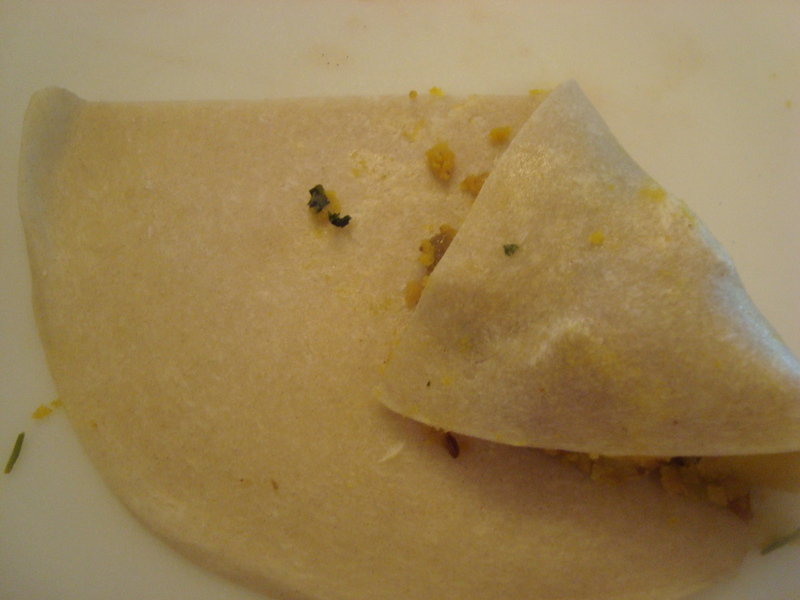 Uncooked tortillas are fantastic to use as the dough for samosas, empanadas and a myriad of other dishes. 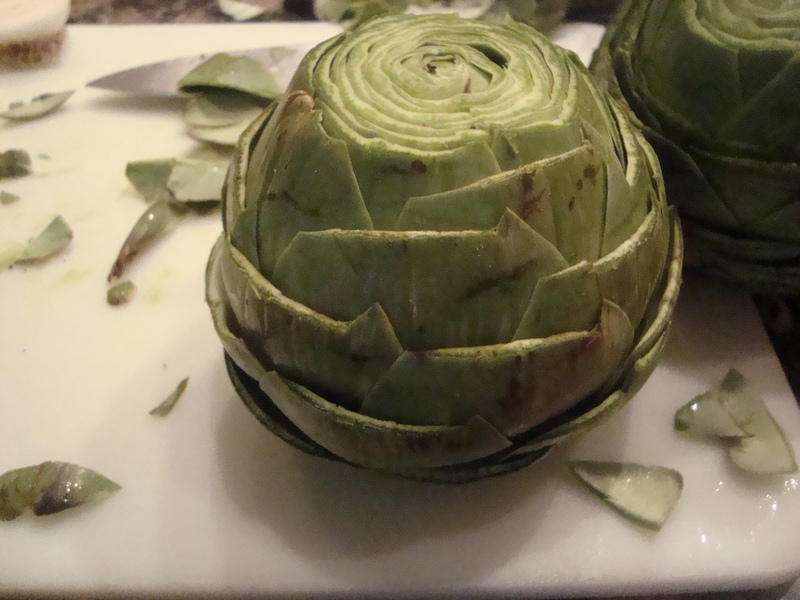 By the way, I usually make a large batch and freeze them in ziplock bags. That way all the up front work is done and when I have guests or need a quick appetizer, I can fry up a batch while they are still frozen and serve fresh and hot with some chutney. 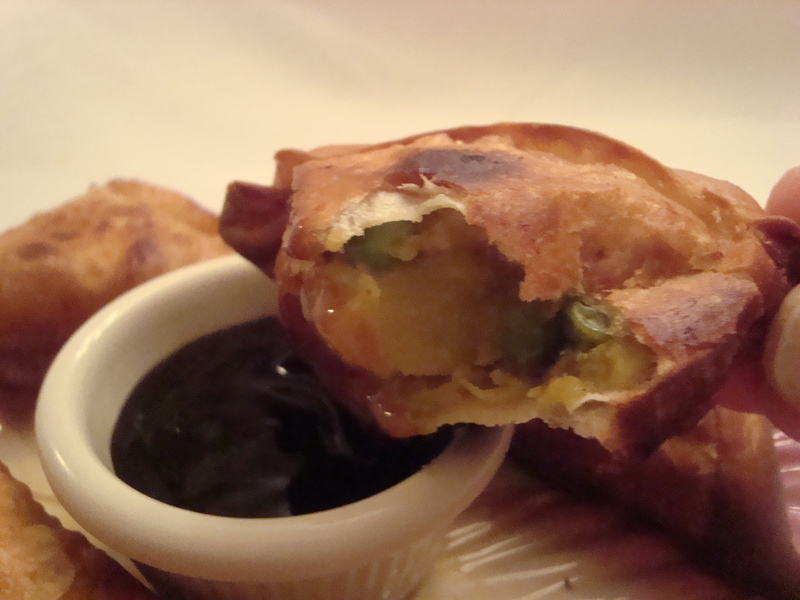 Just add a couple of extra minutes when frying frozen samosas. Here’s my quick and dirty version. 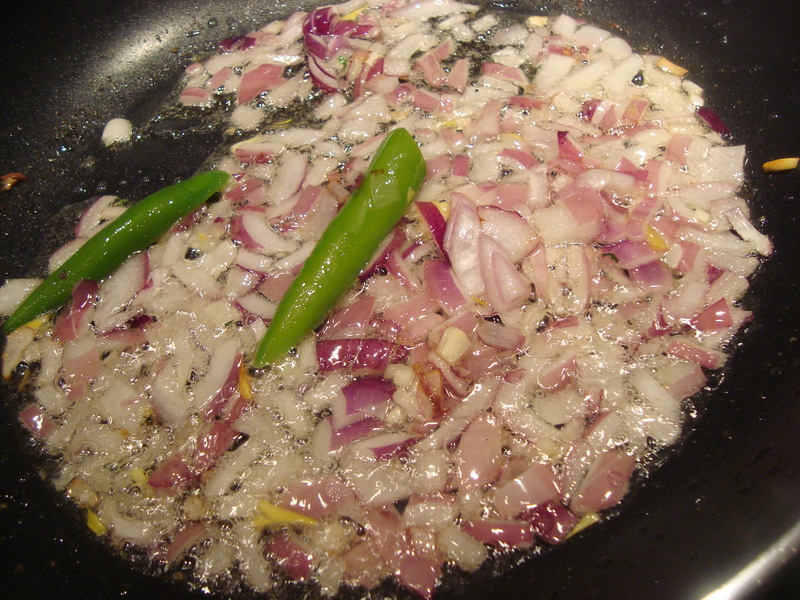 In a medium skillet or frying pan, heat oil and saute onions, cumin seeds and chilies together until the cumin seeds begin to pop. 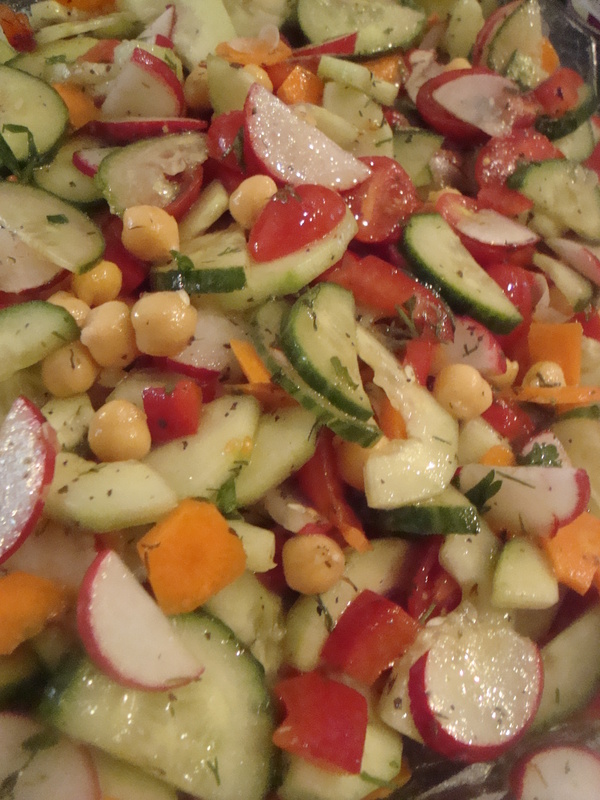 Add coriander powder, turmeric and salt and stir fry for a few minutes. 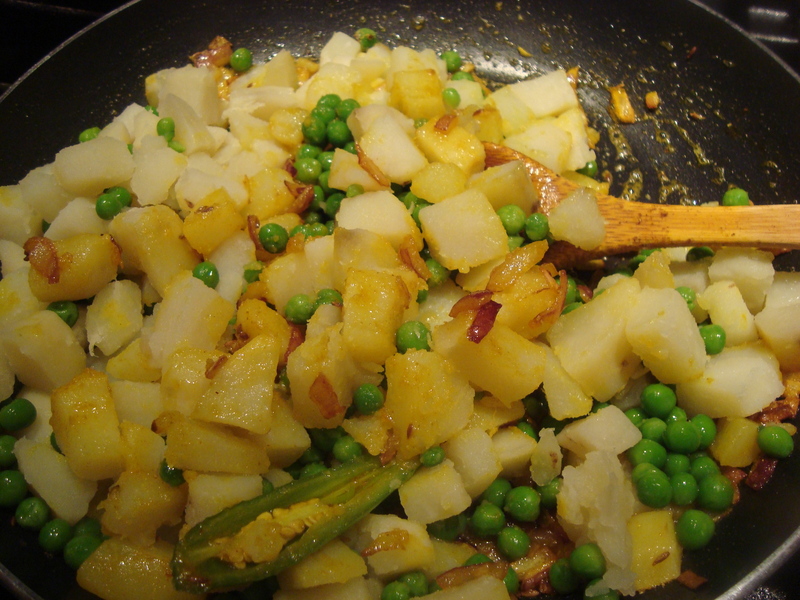 Add the potatoes and the green peas and cook about 4-5 minutes until peas are tender and everything well blended together. Set aside. 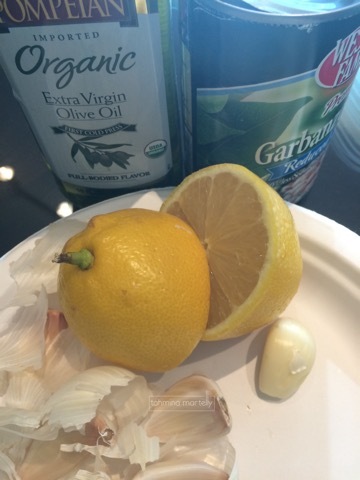 This is a fantastic sauce to have in your fridge. You can put it on so many things. 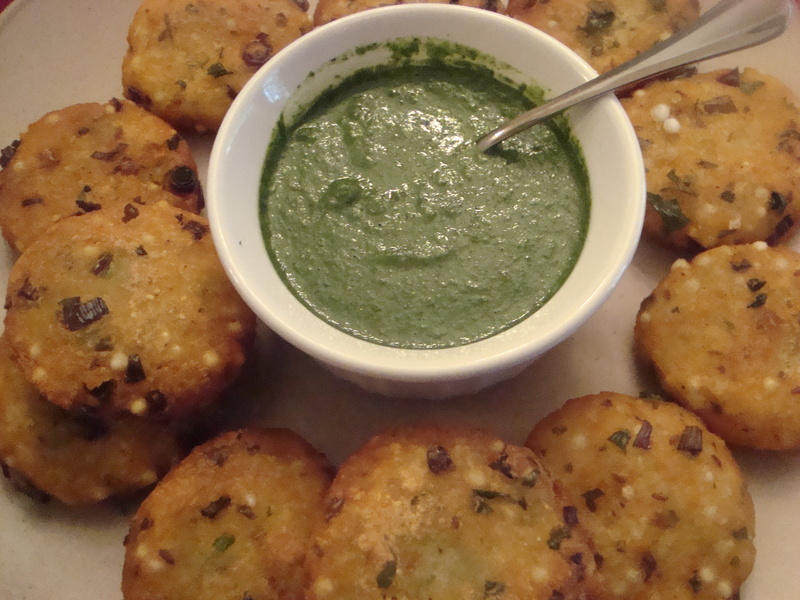 It’s great with Spinach Pakoras, with eggs, as a veggie dip or even as a dressing. It takes about 3 minutes to put together. 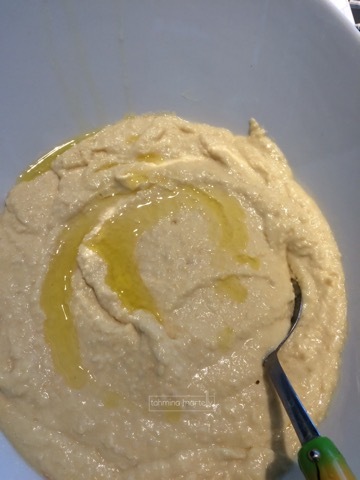 I really enjoyed it with the Tapioca and Potato Boras I made for The Great Leftover Challenge sponsored by Danny’s kitchen, a great blog that I enjoy reading. 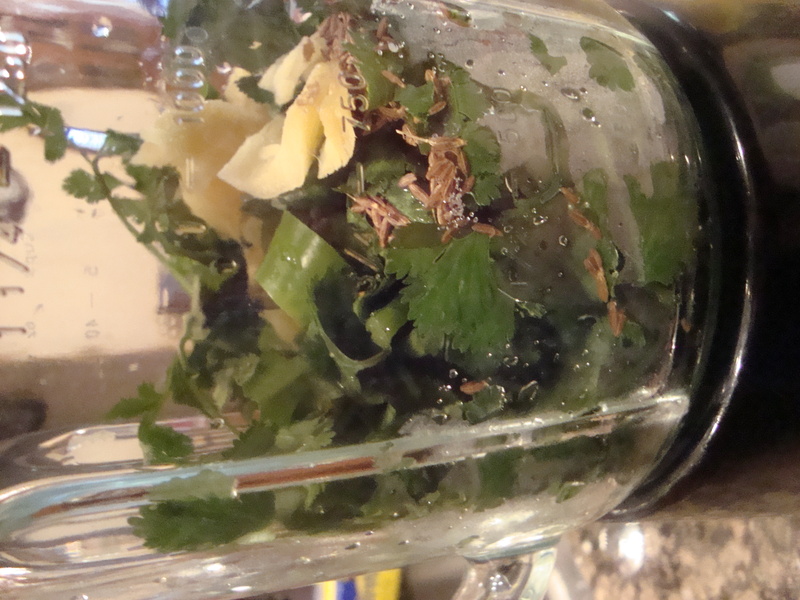 Rough chop the cilantro and ginger. 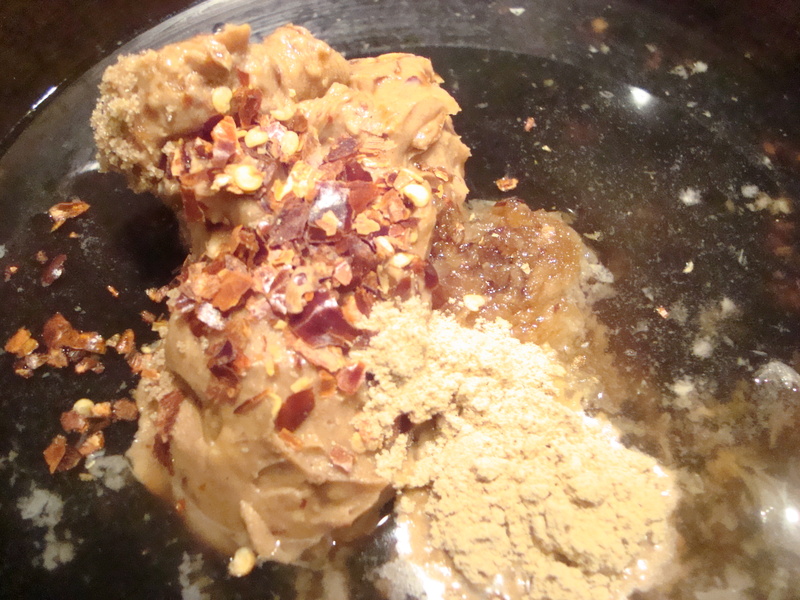 Place everything in a blender or food processor and blend until smooth. 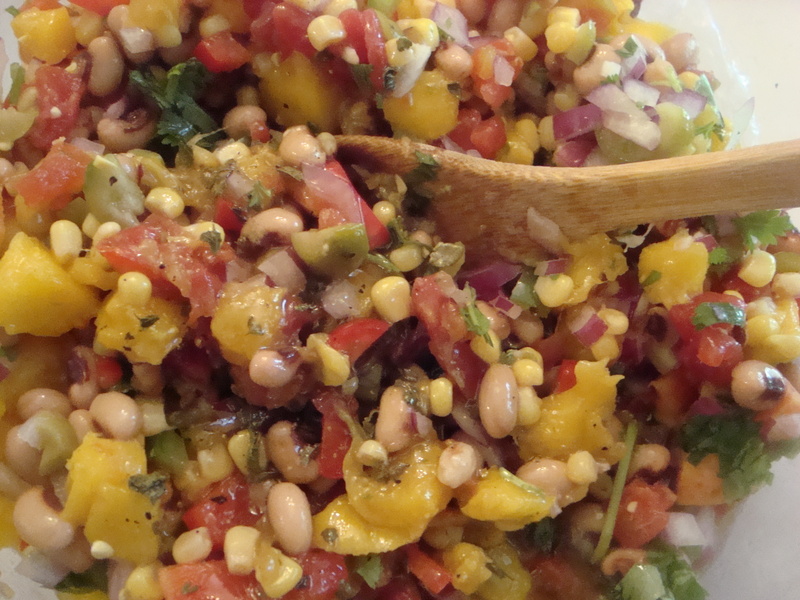 Serve immediately or can store in an airtight container in the fridge for up to 3 weeks.